Renovo is located in Clinton County, north central Pennsylvania. The 2010 census put the population at less than 1,300. Renovo is known for its yearly “Flaming Foliage Festival”, which takes place in October. Built at the mid-point between Erie and Philadelphia by the Philadelphia & Erie Railroad, Renovo began as lumber town. Bituminous coal was discovered in the area, and mining became the main industry until the railroad took over. The train shops in Renovo repaired trains as well as built furniture for other train stations on the Philadelphia & Erie line. In the 1930’s, when President Franklin D. Roosevelt established the Works Progress Administration, multiple Civilian Conservation Corps Camps were established in the area to help restore and recover the forests that had been depleted by lumbering. These camps were vacated when World War Two began. After World War Two, the railroad industry began to collapse. This demise was completed in the 1960’s with the closing of the last railroad shops in the area. In the spring of 2016, we-- Ian, Kate, and Morgan, students from Penn State University-- set out to document Renovo and its surrounding areas. We were interested in it’s lumbering, mining, and conservation history. There’s no getting out unintentionally. Of water, of movement, of life. to cross, depart, come back together again. where everybody waves, even if they know you don’t belong. those bridges that got you where you are to burn. Red Hill is a Late Devonian fossil cite located about 4 miles outside of Renovo in a village called North Bend. The Red Hill fossil site became famous in 1993, when the Hynerpeton Bassetti was found. The Hynerpeton Bassetti was the first fossil of its type to be discovered, it is thought to be one of the earth’s earliest tetrapods, meaning that it lived in water, but had developed the ability to walk on land as well. The fossil, the shoulder bone of the creature, was found by Ted Daeschler and Neil Shubin. Since then, a number of other kinds of fossils have been found in the area, including that of the Hyneria Lindae, a predatory, Lobe-fin fish. Red Hill remains an active dig site for the Academy of Natural Sciences in Philadelphia,and is located directly along State Route 120.
located in the Chapman township building in North Bend, PA. The small museum boasts an active work station, as well as displays featuring finds from the Red Hill dig site.Because the dig site is still active, sometimes members of the dig team will work at the work station, cleaning and identifying their pieces. The Red Hill fossil display is maintained by Doug Rowe, who also oversees the dig site. Rowe is a native to the area and has been working with the dig site for over 15 years. To set up a visit to the museum or dig site, call Doug Rowe at (570)-923-2044. If you work with a dig group, you may keep the fossils you find, unless the Academy of Natural Sciences finds it to be new or of interest to their studies. An expedition to Civilian Conservation Corps Camps surrounding Renovo, PA.
Before the railroad became the primary industry in Renovo, the economy relied on the lumber industry until all of the usable trees were cut down, then on the mining of bituminous coal. These industries left the natural areas surrounding Renovo depleted and polluted. President Franklin D. Roosevelt addressed these problems with the Works Progress Administration (later renamed to the Works Projects Administration) and the Civilian Conservation Corps. The Civilian Conservation Corps (CCC) supplied jobs to unemployed males, and restored the forests by planting new trees and controlling soil erosion, as well as conserving wildlife and streams, fighting insects and diseases, and preventing forest fires. They built fire towers, access roads and bridges, as well as dams, drainage, and irrigation for flood control. Their landscape and recreation work included building campgrounds that are still used by many local, state, and national parks today. Clinton County (where Renovo is located) had 10 CCC camps. The three closest camps to Renovo were Hyner, Two Mile, and Cooks Run, all of which are within 17 miles of Renovo. All three of these camps are also located within what is now called the Sproul State Forest. After the start of World War Two, CCC camps were closed due to the draft. These camps were not re-inhabited after the war, but the site of the Hyner camp now houses a camp ground and is the location of Hyner View State Park. The sites of Two Mile and Cooks Run are marked and have commemorative plaques. Cooks Run CCC Camp, also known as Keating, was established in late May of 1936. 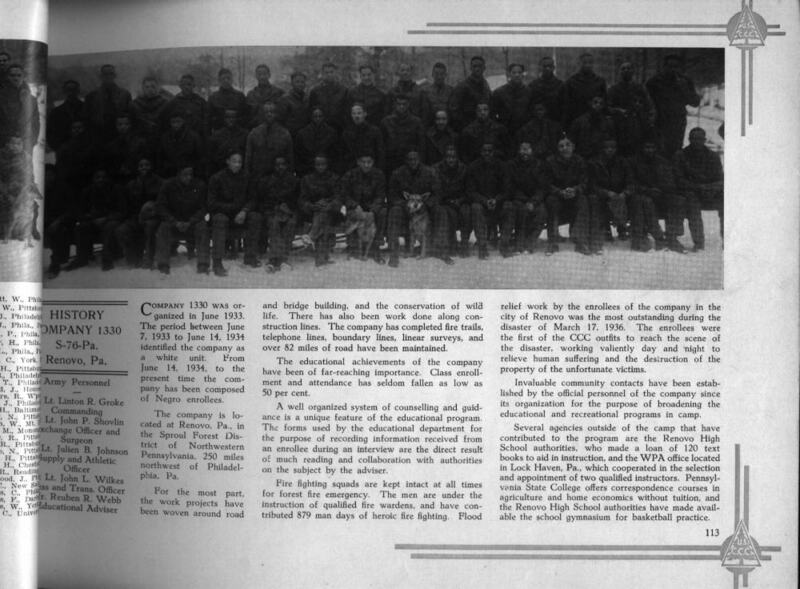 Consisting mainly of boys ages 17-25 from Alabama, the camp eventually received boys from Florida and Georgia, and went by the name “The Cotton Pickers,” represented by the colors red and white. Currently, the location of the Cooks Run CCC camp is being utilized for controlled logging. Federal and State governments allow controlled logging in State and National forests as a way to help thin forests to prevent forest fires, as well as to help renew the forest life and promote biodiversity. While the practice has its benefits, it is also highly controversial due to pollution and animal habitat loss. the floor. Selective logging protects the forest. until they’re big enough to need chopped again. how a sapling could ever break through. Two Mile Run CCC Camp, also know as Lucullus, opened in late May of 1933. The Two Mile Camp is best known for working on Kettle Creek State Park and helping recover the Westport area after a flood in 1936. The men built the Kettle Creek Recreational Area, and a dam that created an area for swimming and boating. Kettle Creek remains a popular place for camping and fishing. In recent years, Kettle Creek has suffered run off from abandoned bituminous coal mines in the area. The Kettle Creek Watershed Association and Trout Unlimited are working on a plan to help deal with the pollution and protect the Trout population in the area. away the powdery orange that caked our hands. The CCC Camp at Hyner, also known as Koller Farm, was established in early May of 1933. The camp was predominantly Black. In 1936, much of Renovo was destroyed by a flood, and the men at the Hyner Camp were the first responders to the incident, saving many lives. The men at the Hyner Camp predominately worked on State Forest land, planting trees, cutting trails, and building fire towers. The CCC camp at Hyner remains in good condition, now offering a camp ground with multiple buildings, camping areas, and a swimming pool. At Hyner View, a handsome statue commemorates the CCC workers in the area. Hyner View state park attracts tourists to its hiking and ATV trails, its incredible view, and its hang gliding launch, which sends users into the valley and over the West Branch of the Susquehanna River. built roads, built friendships, planted trees .